Only three features in, and filmmaker J.C. Chandor has already made himself a presence to be acknowledged. With his debut flick, economy ensemble Margin Call, making a splash at Sundance in 2011 and then earning a surprise Oscar nod for its Original Screenplay, following that up with the mostly-silent All Is Lost which placed a solo Robert Redford in the middle of the ocean, his latest – and strongest to date – shows the tale of a man on his way to the top and in the process risking everything to do so. Rather fitting for someone like Chandor, wouldn’t you agree? With A Most Violent Year, the writer-director takes on his biggest production yet in the form of this mini-epic that is fortunate to incorporate shades of The Godfather, Macbeth and a typical Greek tragedy into the proceedings. Leading the cause is Abel (Oscar Isaac), an immigrant businessman whose oil company is not only facing several corruption charges but is also the target for multiple thieves who sell the stolen oil on to competing trades. At multiple times, however, Abel states his refusal to conform to the dirty dealings of gangsters and slimy businessmen and insists that his conscience stays true and clean even as the most damaging events occur that force him to take action. It’s made clear early on that his is an honest approach – or, at least, as honest as we are allowed to see him be – and that he’s just a man, no different than any other, who desires to build an empire in the most humane and amicable way possible. However, the movie is very clever in asking us whether he truly has the best interests of his business at heart, or whether he’s still just a wide-eyed innocent chasing the American dream – underneath all his smart suits, charming social interaction and cosy living facilities, there is an overbearing naivety to the character that Isaac manages to subtly portray that has us second-guessing his overall motives. In a business sense, he’s biting off more than he can chew as he faces all these setbacks and still maintaining a clear-minded and honest attire in a world where you have to be anything but in order to make it big. With Abel, and by extension his wife and co-business executive Anna (Jessica Chastain, once again positioning herself as one of our brightest and most fascinating new actresses) – whose comparisons to Lady Macbeth are not entirely unfounded – Chandor presents a study of someone putting everything on the line to protect the most important thing to them, even when said important thing is proving lethal to anyone else involved. Case in point, oil truck driver Julian (Elyes Gabel) who is first seen getting carjacked by oil thieves only to later become a fugitive after using an illegal handgun – one of the many shady dealings occurring around this particular story – during a failed hijacking. Paralleled with Abel right down to their identical immigrant backgrounds, his is the more tragic element of the film as we see how much he suffers in comparison to Abel’s lesser problems; for all his legal woes he and his family are still far better off than Julian in every way, shape and form. Both men are ideologically at odds, yet at the same time almost exactly the same in that each are striving for appreciation and success in a very corrupt line of business. 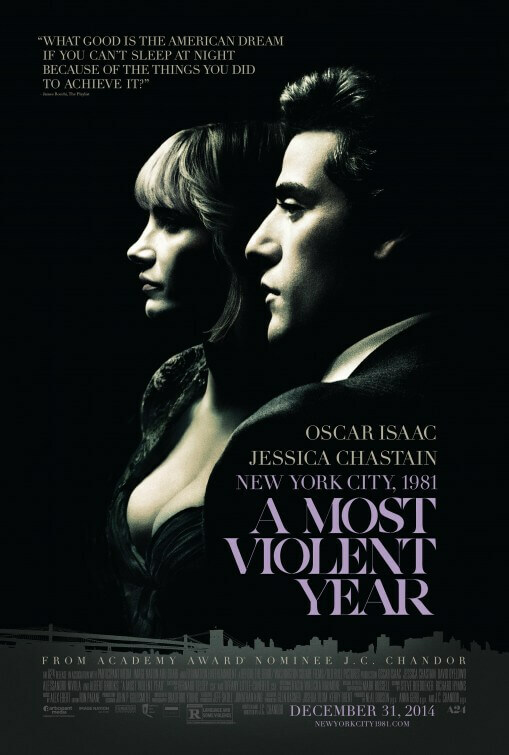 It’s proof that Chandor certainly knows how to keep a crime epic such as this condensed and intensely focused; by having Abel in almost every scene of the movie, we are right there every step of the way as situation after situation continues to pile up against him and everything he has worked for, creating a suspense that leaves us hanging on whether he still stands firmly on the ground by the end of it. Even at just over two hours of dialogue scenes with the odd moment of pumping thrills, Chandor never lets the proceedings become dull or uninteresting. Remarkably, you find yourself fully engaged with the situation and on the edge of your seat to see how it all comes to a head by the final frame, even when it doesn’t end as grand or as big as one may think. The performances, particularly the powerful duo of Isaac and Chastain, are endlessly watchable with those two and their contrasting characters in particular expanding upon an under-wraps dominance play; like we said, there’s a reason Chastain’s character can be likened to Lady Macbeth, and a scene involving an injured deer is testament to that. The cinematography, done by Selma’s Bradford Young, is tinted with a sort of dark yellow that outlines the shady dealings going on around these businesses, and one scene in general – set in a restaurant where Abel faces his most powerful competitors – is shot and lit in a way that could be mistaken for a never-before-seen print from Francis Ford Coppola’s most famous film. Those going in to A Most Violent Year may be slightly disappointed by a lack of cohesive violence as promised in the very title, but in terms of presenting a study of business dealings corrupting the soul to no end, then prepare yourselves; it’s a bloodbath.